We welcome Nan Sterman, Encinitas-based garden designer, author, botanist, and award-winning garden communicator. Nan hosts and co-produces the award winning KPBS TV show, A Growing Passion, which celebrates all the ways that San Diego “grows,” from farms and nurseries to backyards and schoolyards, to native habitats and more. Nan shows us the latest in drip irrigation technologies for our gardens. Nan discusses how easy they are to install and maintain, and how they benefit gardens while conserving precious water. As Nan covers the basics, she dispels common myths about drip, as well. Nan addresses using drip irrigation in special situations such as vegetable gardens, native gardens, slopes, and mixed plantings. She shares some of her secrets and tips, too! Nan Sterman is dedicated to the transformation of planted landscapes from overly thirsty and resource intensive to climate appropriate and sustainable. Nan speaks, teaches, and writes about low water, sustainable and edible gardening, all of which she designs for clients’ homes. She seeks out plants, methods, and technologies that ensure client gardens are as water-efficient, low maintenance, and beautiful as possible. 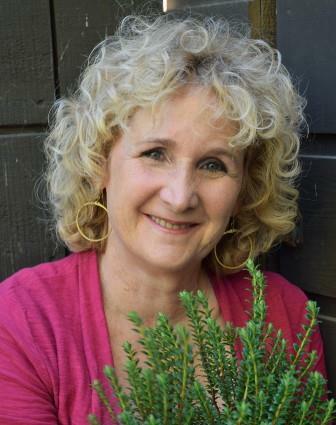 She is author of California Gardener’s Guide Vol. II, about low water, Mediterranean climate gardens written specifically for California home gardeners. Her next book, due for release in Fall 2014 from Timber Press, is Hot Colors, Dry Garden, which illustrates how colorful low water gardens can be. Nan serves as an advisor to the Water Conservation Garden at Cuyamaca College, the San Diego County Water Authority, and sits on the Invasive Plant Committee for the City of Encinitas. She co-founded a 5,000 square foot school garden and founded the annual Encinitas Garden Festival & Tour. Nan is a board member of the Garden Writer’s Association and a founding board member of the Association of Professional Landscape Designers, San Diego District. Nan's websites are PlantSoup.com and AGrowingPassion.com. Nan will be selling and signing her books before and after the meeting.